The gist: If you want strong relationships, but you’re not naturally inclined to build them, this system will help motivate you to stay in touch with people you care about. I’m an introvert. Left to my own devices, I prefer to spend my time alone, working on things I find interesting or important. That doesn’t mean I don’t enjoy having a tapestry of friends or going out to busy places. In fact, I do these things regularly. I even like organizing big parties on the rare occasions I can muster the energy for it. But being an outgoing socialite is not my natural state. Nine times out of ten, if you ask me what I’d like to do, my answer will be to stay home and play a game. Or maybe go out for a quiet cup of tea with one or two friends. My natural, happy state is to keep to myself. I have a rich and very rewarding inner-life. I can sit alone and just think about stuff for hours. Why is the sky blue? Let’s look it up on Wikipedia! How many different types of plants can I name in 10 minutes? Yet, I realize part of being a successful human is fostering relationships. The more great people I have in my corner, the more inspired I am in my work. The more driven I am to improve myself. And the more resources I have to solve difficult problems or do big things I couldn’t do on my own. It just doesn’t come naturally. So, I tried an experiment by creating a simple system that would help me keep up with my friends. I wanted a template I could work from. I resisted the idea at first. I tend to dislike anything around relationships that feels unnatural. Setting a calendar reminder to “call Nana” would make me feel like a failure. Like I needed a crutch to be normal. But I decided this was a limiting belief. Everyone struggles with something, and there’s no good excuse to just accept a shortcoming if you really want to improve. Here’s how it works. I hope you find it useful. I use an app called Trello1 to make it all happen. Because Trello is so flexible, I found a way to use it not just to aid me in keeping in touch with friends, but to gamify the process so it’s fun and motivating to do. Here’s how it works. Feel free to copy it or tweak it for your own needs. Give your board a fun name—something that’ll actually make you want to look at it. Sounds silly, but this is a psychological trick I use to keep myself interested in things. If you’re not having fun, you’re not going to keep using it. 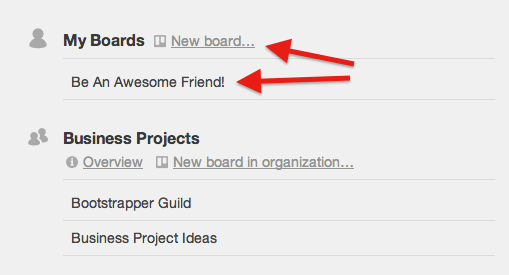 When you start a new board, it’s automatically populated with three lists: To Do, Doing, and Done. Go ahead and delete/archive these. We’re not going to use them. Next, set up 12 new lists, and name each one by month. 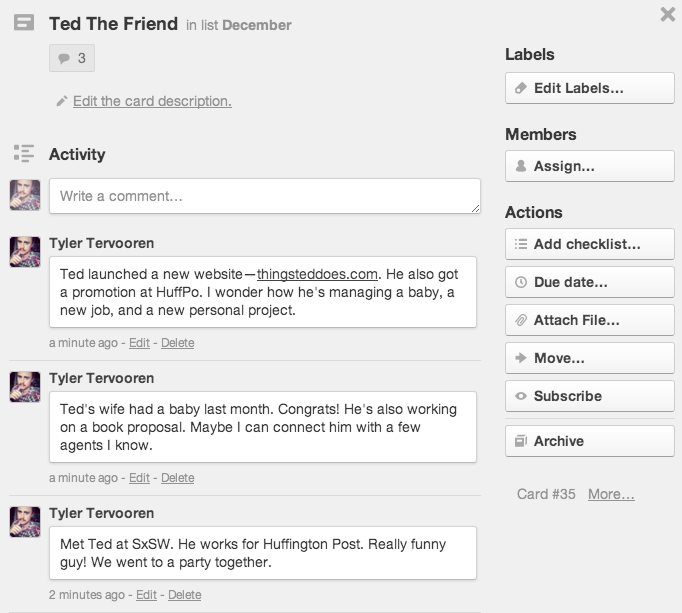 Finally, add a card to January (or whatever month you’re starting in) for each person you want to keep in touch with. Now the fun starts. The goal is to see how many people you can advance, each month, into the current month. When you get in touch with someone from your list, move them into the current month. As an added reminder to myself, I like to leave a little note on the person’s card each time I have a great conversation with them. By the end of the year, you have a nice little record of all the important stuff that’s happened to each person over the last 12 months. Maybe send them a Christmas card telling them how proud you are of everything they accomplished. The result is the same: our friend drifts further and further away. When you’re introverted, keeping in touch with good people you want relationships with doesn’t come naturally. But that’s okay; there’s nothing wrong with you. You’re amazing for a lot of other reasons. And if you want to be amazing at building relationships too, you can be. You just need a system that’s fun and easy to follow. Whether you use the one I described or create your own, here’s to building meaningful relationships with more amazing people. Trello tracks my referrals, but I am not compensated for them.